I don’t get to watch a lot of TV, but when I do, I like watching any of Chef Ramsey’s cooking shows. One thing he emphasizes is plating the food. Plating is the way food is presented. It doesn’t matter how good the food really tastes—if it doesn’t stimulate the eyes, it will affect how appetizing the customer perceives it to be. The same is true with anything that needs to be presented—including information. Your audience wants to understand the message quickly and in a way that doesn’t take too much work to decipher. I’ve already discussed the need of keeping it simple; but for presentations, handouts, flyers, or even your organization’s website, everything also needs to be visually pleasing and organized. Formatting is so important. Start a new paragraph for important points, utilize bullet points when necessary, and bold the appropriate words. If it isn’t visually pleasing, the odds of people actually reading or hearing what you have to say are lower. Don’t believe me? 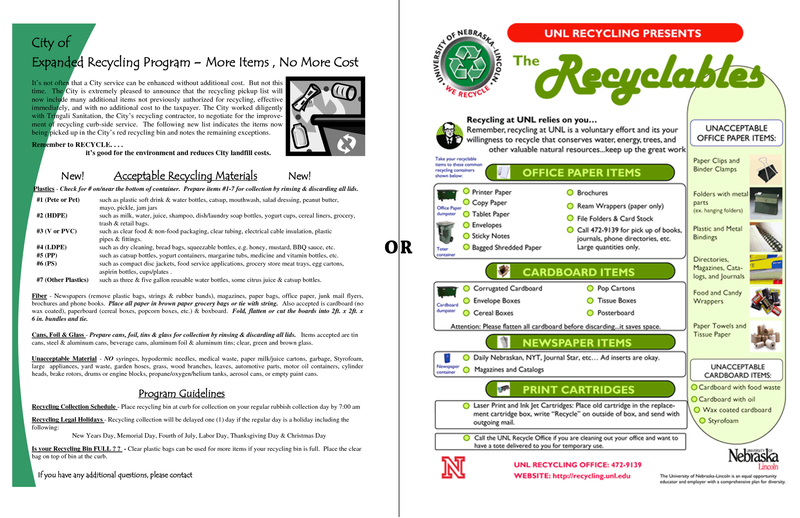 Which one of these recycling flyers do you prefer? The purpose of the flyers is the same: informing the public about which items are recyclable. However, The flyer on the left contains too many words and doesn’t easily present the main points. You want to make sure that even if someone were to skim your material, the point would still be understood. So after you gathered what you want to say, you’re not finished yet! Spend just as much time working on the best way to present it. We tend to over-complicate things in life, and when it comes to defining what successful leadership looks like, we really, really, over-complicate it. Much of what constitutes leadership success comes down to common sense, but unfortunately it’s not always common practice. Searching the shelves of your local bookstore (do those still exist?) or doing a search on Amazon.com would lead you to believe that to be a successful leader, you’ll need to discover the keys, take the right steps, obey the laws, figure out the dysfunctions, embrace the challenge, ascend the levels, look within yourself, look outside yourself, form a tribe, develop the right habits, know the rules, break the rules, be obsessed, take control, let go of control, learn the new science, or discover the ancient wisdom. Did I say we like to over-complicate things? 1. There aren’t any shortcuts – Leadership is hard work and most of it is on-the-job training. Formal education and ongoing development are essential parts of developing your leadership competency, but don’t think you can transform yourself into a great leader by reading a certain book or taking a particular training course. Great leaders are built by being in the game, not by standing on the sidelines or sitting in the classroom. 2. Great leaders start by being great followers – Most successful leaders were successful followers at some point. They learned how to be part of a team, put the needs of others ahead of their own, and work toward a goal bigger than themselves. In our hero-worshiping culture, we tend to place the spotlight on the individual achievements of leaders, and not pay much attention to how they cultivated those winning ways earlier in their career. Learn to be a good follower and you’ll learn what it takes to be a good leader. 3. There’s no mysterious secret to leadership success – Contrary to the titles of popular leadership books, there is no single, mysterious secret to unlocking leadership success (see truth #1). All those books I lovingly teased earlier offer valuable insights about various aspects of leadership, but most of them tell you what you already know to be true…which brings me to the next point. 4. You already know what it takes to be a good leader – Not to plagiarize Robert Fulghum, but you probably learned in kindergarten most of what it takes to be a good leader. Be nice. Play well with others. Say please and thank you. Do what you can to help others. Of course you have to mature and apply those fundamentals in adult ways like being transparent and authentic with others, challenging people to strive for their goals, holding them accountable, and having difficult conversations when needed. So there you go. Those are my seven simple truths. What do you think? What would you add, delete, or change? Feel free to leave a comment with your thoughts. Just don’t make it too complicated. This is about some deficiencies of mine. I’ve got a few. Do you have any? Yes, I suspect you do. I was born in 1950. I’m pretty computer/tablet/phone literate. But I am very slow. I still “hunt and peck” on the keyboard. And I am pretty much a two-to-three finger typist on my tablet and phone. When I get around people younger than I am (and increasingly, that is almost everybody I end up being around), I watch them on their phones. I watch with something close to amazement. How do they do that? Especially the really young ones. They type on their phones faster than, well, faster than seems humanly possible. They seem to use all their fingers—but especially the thumbs. I feel like a horse and buggy in the age of Teslas. (Side note: true story—in my classes at the community college, I used to tell a story about “buggy whips.” I don’t anymore. You know why? My students do not know what a buggy whip is.). learn to type with my thumbs on my tablet and my phone, and then add other fingers. I have an iMac. And I’m pretty much a “type a bunch of words” content guy. Images? I borrow them all. Slides? Well, I can use PowerPoint and Keynote; but I’m pretty simple. Nothing fancy. I can actually make the case that simple. Big font and a few words per slide is a good thing to make points clearly. But I see these folks with great images, embedded videos, and all sorts of great creativity in their slides. I feel just a little bit overwhelmed, and more than a little bit behind the times. learn some creative techniques for adding images, and learn to easily embed videos in my slides. These are just two items on my “to learn list.” I have others. I need to learn how to use Excel effectively; well, first I need to learn how to use Excel at all. (I told you— I’m a Mac guy). And, I need to make more time to read books that are a little further outside my norm. At least I know how to do that one. I just don’t do it enough. Actually, my list is pretty long on stuff I need to learn. What’s on your “to learn” list? Listening to the different challenges that leaders face sometimes reminds me of the story about the parents of a famous baseball player named Harmon Killebrew. As leaders, it’s easy to forget that at the end of the day, we are raising people to be leaders. That’s really more important than the products we produce or the service we provide because if we raise up leaders, they will produce more and serve customers better. Intentional Redundancy – We really can’t just say things once or twice and expect people to get it. We have to say things over and over. Availability – People can’t communicate with us if they can’t find us. Show people that you are accessible by going on their turf and taking time to listen. Follow Up – Letting people know what happened with the information they shared is as important as asking for it in the first place. No one likes to feel used. When you ask for information and people never know what you did with it, they feel discouraged. Respect – If you want to raise up leaders, treat them with the respect you think leaders deserve; and most of the time, people will live up to your expectations. You always hear about the importance of listening, but yet it continues to be an ongoing problem. Why is that? Why can’t people just listen? Probably because they don’t even realize they’re not listening. Before you can perfect the vital skill of listening, you need to realize what type of non-listener you are. These are the kinds of people that usually come to mind when the topic of not listening comes up. Ramblers dominate, and sometimes even derail, the conversation. They keep talking over the other party and reiterating their point until the receiver is too tired to continue. These non-listeners have automatic responses when they hear certain inflections or pauses within the conversation. When the speaker pauses mid-sentence, that’s the robot’s cue to say, “mmm hmmm.” When the speaker sounds like he/she is telling a joke, the robot will laugh during the appropriate pause. They also sprinkle in a couple yeses here and there. Robots usually resort to these tactics because they are bored or multitasking. Regulators already have an agenda in mind when they engage in a conversation. Their only purpose is to confirm their predisposed disposition. Although a regulator may look attentive, he/she is basically hearing crickets until what they want to hear is finally said. Which category would you fall under? Be very aware of it the next time you engage in a conversation, and consciously avoid doing it. Enter conversations with no prejudgments and ask for feedback frequently throughout the discussion. And as you learned as a child, don’t talk when the other person is talking (to yourself or aloud). It’s no coincidence that the word listen shares the same letters as silent. The goal isn’t getting to the top. The goal is getting back down—finishing well. Many leaders struggle with finishing well. Ironically, success plants the seeds for derailment. Success encourages complacency and arrogance, both of which erode character and obstruct growth. Finishing well requires a life-long commitment to self-awareness and growth. And that means feedback. Any leader that struggles with openness to feedback is flirting with disaster. They have a purpose beyond their own self-interests. They are accountable to people who will tell them what they don’t want to hear. They maintain the intellectual, emotional and spiritual reserves necessary to get them to the finish line. They know the goal is getting to the finish line with their character intact. They know they must rely on others and are willing to listen and learn. “I graduated from college in 1991 and from business school in 1995. But with each passing year, fewer and fewer of my colleagues were women. More and more often, I was the only woman in the room. This is a short, simple post. Call this a blinding flash of the obvious. If a group is underrepresented (and, women are; Hispanics are; African Americans are; and others…) in the key decision-making bodies within organizations, it is time to enlarge the circle of candidates as decisions are made regarding who will have the next seats at the table. Because the table is where the discussions happen and progress is made. And, those discussions provide the over-time experiences that build understanding, knowledge, and value in having that person at the table. In other words, sitting at the table makes you more valuable the next times you sit at the table. Every person now with a seat at the table was once new at the table. We just need to expand the group which is invited to those new places at the table. So, in order for them to have more seats at the table, they have to have, you know, actual seats—at the actual table. They have to be in the room, sitting at the table, to have a seat at the table. “Women became 50 percent of the college graduates in the United States in the early 1980s. Despite these gains, the percentage of women at the top of corporate America has barely budged over the past decade. A meager twenty-one of the Fortune 500 CEOs are women. Women hold about 14 percent of executive officer positions, 17 percent of board seats, and constitute 18 percent of our elected congressional officials. In other words, there are not enough seats at the table made available for women in our country. Or, to put it another way, to be in the know, on the “inside track,” you have to be “inside.” Being outside makes it impossible to be in the know. You can’t have the “inside track” from the outside. This really does need to change. And, by the way, the research does in fact support that such change would be good for all. More women with seats at the table. More Hispanics with seats at the table. More African-Americans with seats at the table. Because the seats at the table is what inclusion is all about. You can’t practice diversity without having diversity among the participants in the discussions at the table. I have heard a wide range of responses, including everything from management to closed minds and apathy. However, there’s one thing I’ve never heard anyone say. No one has ever said, “Mike, to be honest, I am the real problem.” No one has ever even said something like, “Maybe it’s me,” or “I may be part of the problem.” Instead, many people feel like they should be nominated as the MVP. They are just puzzled that no one else sees it that way. Here are some questions that might be worth using to have an honest conversation with yourself. Do I extend trust to others? Can people really trust me to always put the team ahead of myself? Can I be trusted with sensitive information? If everyone followed my example, would this team function smoothly? Do I handle conflict in a realistic way? Do I seek the win-win in conflict, or do I seek the “I must win” in conflict? Do I give the support to other people’s vision that I want them to give to mine? Do I emotionally buy in to what the team is doing, even if it wasn’t my idea? Do I make other people’s jobs easier? Does my attitude encourage others? If everyone else worked the way I do, would this team be better? By the way, I suspect that if the answer to every question above is a slam dunk “ABSOLUTELY,” you might be the problem.